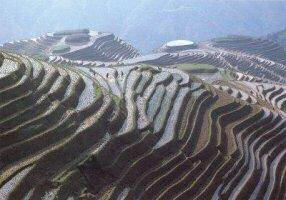 Left ---- The Longsheng area of Guangxi is famed for its dramatic dragon-backed rice terraces. Rising 3,000 feet from the valley floor, the paddy fields are the result of 18 generations of toil by the Zhuang minority people. An intricate system of bamboo pipes keeps the terraces well watered.